It’s a cold winter afternoon and you’re walking down the street. Suddenly, the cutest dog you’ve ever seen walks past you. You try to snap a photo of it with your smartphone but you can’t; you’re wearing gloves and your smartphone won’t register your touches to open the camera app. With the dog now gone, you’re left wondering: “Why touch screens don’t work most of the times that I have gloves on?”. Gloves have a certain thickness. This thickness causes the finger not to be able to touch the surface of the touchscreen. The finger is now at a constant distance above the screen, equal to the glove’s thickness. Touch screens are made to operate when a finger (or in some cases other pointers, like styli) touch their surface. In this case, the finger is hovering above the screen instead of touching. So, it makes sense that the touch wasn’t registered since this is a different scenario than the one it was designed with in mind. By wearing your thinner set of gloves, the touch actually registers! The finger is still hovering, but this time it’s actually closer to the surface! That means that the thickness of the gloves plays a role on whether or not the touchscreen will be able to pick up your touch. You can intuitively understand why this happens: the closer the finger is to the screen, the more it approximates the state when the finger actually touches the screen, so the closer it comes to the nominal operating conditions of touchscreens. But this is just one of the factors that contributes to this phenomenon. Let’s back up once more. You now wear a pair of gloves with the same thickness as the initial pair, but they’re made from a different material. The touch registers! What we understand from this, is that materials also play a part in this. To understand why this happens, think of another example: you just hover your bare finger above the screen, at a distance equal to the thickness of the thin glove. Nothing happens. What’s different this time around? It’s the material between the finger and the touchscreen. When wearing a glove, the gap between the two is filled with the material the glove is made of instead of air. This changes the material property called “relative permittivity”. Without going into too much detail, relative permittivity indicates how much a material affects an electrostatic field. The larger it is, the more the field is amplified. Different materials have different relative permittivities. Air has a relative permittivity of 1. For example, cotton (a common material of gloves) has a relative permittivity of about 2, latex of about 24 and the human skin of 70. 70x more by the human finger than air. latex about 3x less than the human finger. This is more of an intuitive oversimplification than how these phenomena actually work, than their actual relationship is, as it is far more complex. However, this analysis depicts the underlying trend of how a material’s relative permittivity affects touchscreen performance. This explains why different gloves perform better than just hovering our fingers and why some gloves perform better than some others. Will I be able to use my smartphone with my gloves on? Well, it depends on the gloves you’re using! 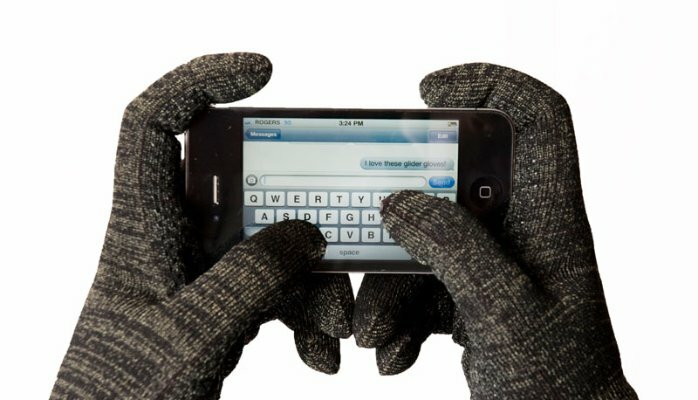 Now while in the case of using a smartphone, you could simply remove your gloves and use it, the same doesn’t apply for touch screens used in industrial or harsh environments. In these cases, touch sensor designers must ensure that their designs are compatible with gloved touch. The intuitive analysis we did above cannot lead to safe conclusions about the verification of the performance of a touch sensor when used with gloves. Due to the complexity of touch screen designs, verifying with prototyping or simulation seems to be the most suitable solution. No one can deny that prototyping can lead to products with exquisite quality. However, verifying with prototyping can be a long and costly process in this case. The amount of thickness and material combinations of gloves is huge, so verifying for all of them is would require a tremendous amount of time and resources. The best way to solve this problem is by using a simulation tool that easily lets you tweak the touch sensor design and change the gloves materials and thicknesses. To prove the efficiency of the proposed method, we have developed a use case in which we investigated this phenomenon. In this simulation-based study, we investigated how pointers covered with gloves differing is sizes and materials performed.